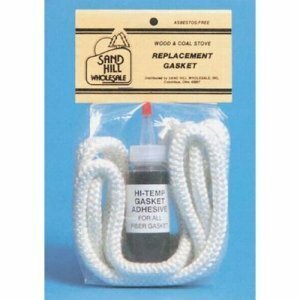 Stove gasket kit comes with 7' of 1/2" rope fiberglass Door gasket and High-temperature Cement (adhesive). Other sizes available. Note. If unsure of the correct size, you can measure the width of the door channel or consult your manual. This size is used on some Ashley Stoves, Aurora, Black Bart, Blue Ridge, Cemi, Earth Stoves, Gibraltar, Glacier Bay, Hitzer, HotBlast, Johnson Energy Systems, Lilly Stoves, Long Manufacturing, Riteway, Sierra, Silent Flame, Squire, Sweet Home, US Stove, and more. For more information or questions, please call 336-701-0555.